The first home version of Pac-man is difficult to review. On one hand, it was famously rushed to market, programmed in a mere six weeks. The colors and sounds bear very little resemblance to the arcade. 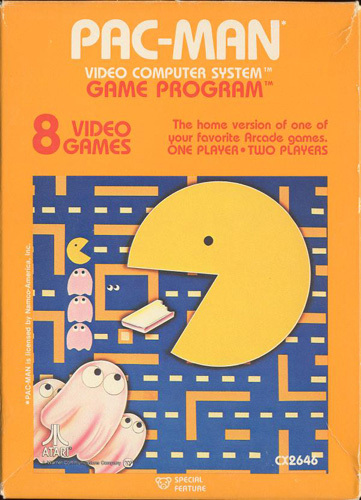 More importantly, Pac-man is essentially a single board, played over and over. The varied behaviors of the different colored ghosts gave the player a sense of strategy. The increased pitch of the siren background noise and the various bonus “fruit” to collect gave the player a sense of progression. In the home game, the ghosts are essentially the same and the fruit bonus always looks like a "Poptart-Fig Newton lovechild" (and that's being kind). Fans looking for a home port on the level of Space Invaders were surely disappointed. On the other hand, I remember playing this game for hours in the early eighties. While crude and overly simplified, the basic gameplay remains intact. The sound effects are again quite different from the original game, yet memorable and fun in their own right. For a title that caused a dent in Atari’s reputation and is often cited as one the games that started the industry on the path towards the videogame crash of 1984, it's certainly not one of the worst games of all time, and it can be fun on its own merits. Based on gameplay alone, Atari’s Pac-man a guilty pleasure at best, but considering its infamy and how common it is to find, it probably belongs in your collection. Difficulty Switches: PAC-MAN has two difficulty levels. When the DIFFICULTY switch is in the B position, the power pills last longer and the vitamins stay on the screen longer. The A position is for the advanced PAC-MAN player. 1997-2018 Ben Langberg, all rights reserved.